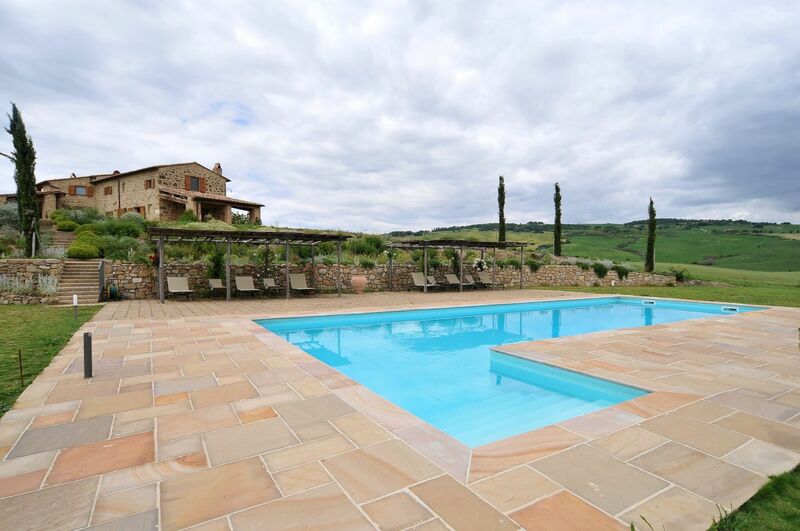 Villa Armani is in the Tuscan countryside a short distance from the beautiful city of Cortona. The villa is part of a large property, with a surface of around 400sq.mt. completely private and intended for the guests who stay at the villa. The garden has hundred-year old plants, hedges, bushes and trees, typical of the Mediterranean vegetation of this part of Tuscany, offering the guests a holiday in complete relaxation and peace. The position is ideal for reaching the small hamlets and cities of art of Tuscany and Umbria. The villa is a building from the 1600’s built in “pietra serena” a typical material of this area, making up part of a large agricultural estate of a noble family from Cortona, who still own it. After a careful restoration the villa has been destined for welcome guests, and for spending a relaxing holiday in this beautiful countryside near to Cortona. The villa ha a surface of around 360sq.mt. divided over 2 levels and can host in total 12 people, the cottage has a surface area of around 60sq.mt, with a small loft and can host 2 people + 2 children. The swimming pool has a completely fenced garden area of around 100sq.mt. From the entrance on the ground floor one enters into a large open space furnished on one side with the lounge area and on the other a built-in kitchen with a large dining table, a French window allows access to the external patio furnished with a table a chairs for convivial moments outside under the pergola. On the ground floor there are also 2 double bedrooms, 1 twin bedroom, 2 bathrooms with showers and a small service bathroom. The internal stone stairs connect to a large lounge with a fireplace on the upper floor, where there are 3 double bedrooms and 3 bathrooms. The Cottage an annex, 30mt. from the villa, is independent and with a private garden. From entrance, on the ground floor, there is a lounge with a small fireplace, a well equipped kitchen, a double bedroom and a bathroom with a hydro-massage. On the mezzanine floor there are available two single beds. The Cottage has a private garden, a beautiful portico with a lunch area and a beautiful panoramic view of Cortona and the countryside. This historic residence is surrounded by a park, full of very old trees, flowering gardens, olive groves and vineyards where one can find peace and relax, also around the swimming pool area there are large umbrellas, sun-beds, chaise lounges, tables and chairs. The swimming pool is 7mt.x14mt and has an entrance into the water by Roman steps, hydro-massage, and the necessary services and a shower. The villa is found about 5km from the city of art, Cortona. The medieval city offers one the possibility to visit the Etruscan Museum, the Diocesan Museum, The Churches and the beautiful Girifalco Fortress. In the historic centre of the city and nearby there are restaurants, typical style restaurant, bars and artisan shop. In the fraction of Camucia, about 3km there are supermarkets, banks, petrol stations, pharmacies. The train station of Terontola-Cortona is the closest to the villa. Siena: 40km, Florence city: 100km, Orvieto: 80km, Assisi: 60km, Lake Trasimeno: 10km, Montepulciano: 48km, Pienza: 58km, Arezzo: 45km, allowing the guests to reach these hamlets and cities of art of Tuscany and Umbria in a short time. Heating: to be paid by consummation.